A family on their way to temple fair. On a white shadow wall of translucent canvas, the Monkey King was fighting with Princess Iron Fan and her husband, the Ox King. Their dazzling kungfu captivated the audience. Suddenly the classic scene from the novel Journey to the West changed tone and, to the accompaniment of stirring Spanish music, the Monkey King became a bullfighter, holding a red cloth in front of the Ox King. 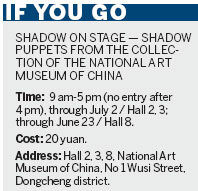 The shadow play was performed at the National Art Museum of China and showcased 481 shadow puppets from the museum's collection. Originating some 2,000 years ago, shadow plays have even assumed the role of Chinese cultural ambassador to other countries such as Egypt and France, and the art form was included in China's first State-level intangible cultural heritage list in 2006. "The 47 groups of 481 exhibits are the most representative ones selected from our 17,000 shadow puppet collection," said Guan Hong, director of the exhibition. "It features major schools of shadow play, from Beijing, Hebei, Shaanxi and Liaoning." The exhibition was divided into three themes: figures, objects and plays, to reveal the many crafts and skills involved in the art form such as puppets, props, tools, instruments, videos and live shows, said Guan. 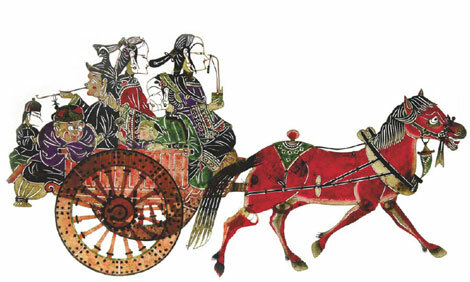 As part of the exhibition, the Changli Xiangdong Shadow Play Troupe of Qinhuangdao, Hebei province was invited to perform at the National Art Museum of China for the third time . "I was so amused by the performance," said Janneke Holwarda, a Dutch drama teacher. "I was not familiar with the story but it didn't stop me from enjoying it." The colorful figures, live music and dubbing, vivid movement and blurring light and shadow fascinated the audience. But the audience was also interest in exploring what was going on behind the shadow wall. Some couldn't wait till the show ended and moved closer to the curtain that isolated the backstage area, trying to peek through the narrow slit between the shadow wall and the curtain. Behind the shadow wall, more than 50 puppet characters, including figures, animals and weapons were all controlled and voiced by just eight people. The movements and facial expressions of these puppeteers were even more dramatic and exaggerated than the shadow puppets during the performance. The change of puppets was so busy that no one noticed if someone stepped on his or her foot. "Our shadow puppets are made of donkey hide, which can be used for at least 80 years," said Zhang Xiangdong, head of Changli Xiangdong Shadow Play Troupe. "The Tangshan School of shadow play is famous for its lifelike movement and exquisite dubbing, and the four-stringed instrument is our unique accompaniment," said the 64-year-old, explaining the specialties of different schools of shadow play. Beside him was his colleague Liang Suzhi, who played and voiced Princess Iron Fan. She was explaining to the audience how pieces of donkey hide could be polished, cut, carved, colored and then joined together to become a shadow puppet. The 46-year-old, who learned to make and play shadow puppets when she was 18, also taught the audience how to differentiate puppets from various areas by shape and style. A visitor surnamed Wang listened and observed carefully. She then repeated it in Chinese and English to her 8-year-old son Mengmeng. "My family migrated to Canada 10 years ago and my son was born in Canada," said Wang. "The exhibition is a great opportunity for him to know more about traditional Chinese arts and culture."